Guests have described Aloha Aku as ‘the most tranquil and ultimate place for relaxation!' You can’t help but feel the peacefulness of Maui's beauty wash over you here. The beach out front of Aloha Aku is only accessible from Aloha Aku or the private neighboring homes and condos. As a result the beach is underused and hardly traveled. Sometimes it's like having your own private beach. Your hosts, Charlene (Maui-girl) and Gary (G-kane) (pronounced ka-nay), have upgraded all the Suites to include air conditioning, ceiling fans, free high speed Wi-Fi, free designated on property parking, key codes for everything (no keys or cards to worry about), flat screen HD TV's with DirecTv in the living room and in the separate bedrooms. Warm up a snack or make yourself a full meal in your Suite's fully equipped kitchen. Take a cool dip in the ili-ili (smooth) stone dipping pools or take an invigorating Jacuzzi while watching the stunning sunsets. In addition there is a gas barbecue on site nestled between some acacia palm trees overlooking the State protected La'ie wetlands. Beautiful secluded. All the beach toys you could want from kayaks to SU paddleboards. Bicycles were a welcome plus. Will definitely come back! Big Mahalos for the five stars! It was great to have you. looking forward to having you back soon. My husband and I really look forward to our winter trips to Kihei. Montana has very long winters. We always stay on the water and usually at the same place. Luckily we have always been very happy with our accommodations and especially our old location between Kam I and Kam II. This year we uncharacteristically chose to change things up a bit and stay at Aloha Aku - which is located about a mile north of where we usually stay. From reservation to check-out it was the absolute BEST experience we have had on Maui. The owners live on the property and family members help take care of the grounds and the units. The attention to detail and guest services were really impressive and the atmosphere was very relaxing. A little nervous about changing locations this year, it became clear on our first night that we would be happy we did. The beach is quiet and we watched whales and saw so many turtles we actually got kind of used to them! We are already trying to figure out our dates for January 2020. I think we found our new "spot". Priceless location: Ocean and Sunset. Views Galore! It's another world staying at Aloha Aku! The magnificent sunset and ocean views from our Coco Palm suite was everything, and more, than expected!!! I really didn't want to leave my suite. This place soothed our restless body, mind, and soul! We had a blast falling off the paddle boards while attempting some yoga poses! We recommend using the kayaks early in the morning before the wind picks up. The treat was knowing the water sports equipment and bikes were included at no extra fee. The delicious banana bread, fruits, and cold drinks were a super nice treat upon arriving after a long flight! There is so much to LOVE about this little slice of heaven on earth!!! SO MUCH, I've already booked the entire place for my Happy Health Wellness Retreat next year!!! Mahalo MaryAnn! We are incredibly happy to know that you had a wonderful time! Looking forward to hosting the Wellness Retreat next year. Aloha! We were so lucky to stay here it was everything a vacation house should be, peaceful, clean, quiet, close to everything . Everything that was needed was there at our finger tips. Every appliance worked! The air conditioning was spot on. Plenty of hot water! Soft towels and soap. I would definitely return! We are incredibly happy that you had a wonderful stay! We hope you return soon! I've had the experience of getting somewhere and immediately thinking "this is nothing like the pictures." This one is so much better in person! You have your own beach right in your backyard! The grounds of the property are beautiful and very well maintained. There are always turtles swimming by, kayaks, chairs, towels, snorkel gear, bikes, games, books, exercise equipment, anything you could possibly need that you're not going to get at a hotel. The bed and pillows were very comfortable. There's a washer and dryer so you can come home with clean clothes (always a plus after our sleepless 12+ hr trip home). There are really too many things to list here! We stayed thru hurricane Lane. Even though Kihei didn't get any major wind or rain, the owners were well prepared. You can't go wrong staying here and you won't be disappointed! Mahalo! we are incredibly happy that you had a fantastic experience! Thanks for weathering the Hurricane with us. We hope that you will visit again soon! Aloha Aku, Char, Gary and Linda are all amazing. The location is beautiful and feels like your own private beachfront oasis. They were wonderful hosts, the rooms are very nice, and everything you need is right there. If your looking for a private Maui getaway thats still close to everything this is the perfect place! Mahalo Tabitha! We appreciate such a great review! 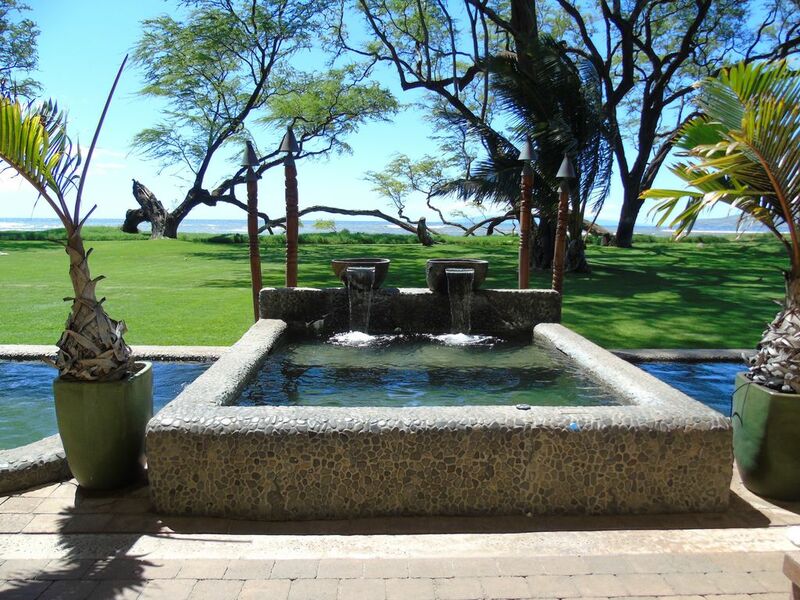 We hope that you will visit us again on your next Maui Vacation.